As a reviewer, how do I complete my assigned reviews? How do I assign a review that has a conflict of interests to a new reviewer? Once reviewers are added in the Committee section and abstracts have been submitted, you can start assigning abstracts to your reviewers. This is done from your abstracts table. Choose the abstracts to which you'd like to assign or unassign reviews. Select a task: assign or unassign. For assignments, choose a method: randomly distribute or manual. Select reviewers to assign or unassign. Click next and confirm the action to proceed. Randomly distribute: specify the number of reviews you wish for each abstract and the selected reviewers will be randomly distributed among the selected abstracts. If an abstract already has the desired number of reviews, there will not be any additional assignments for this abstract. Manual: all the selected reviewers will be assigned to the selected abstracts. If an abstract-reviewer pair already exists, it will be skipped. You can unassign abstracts to reviewers in bulk. Simply select which abstracts and the list of reviewers to unassign. Only the reviewers already assigned to at least one of the selected abstracts will be displayed. Please note that you can't unassign a reviewer to an abtracts if it has a completed review. You must delete the review manually from the reviews table. 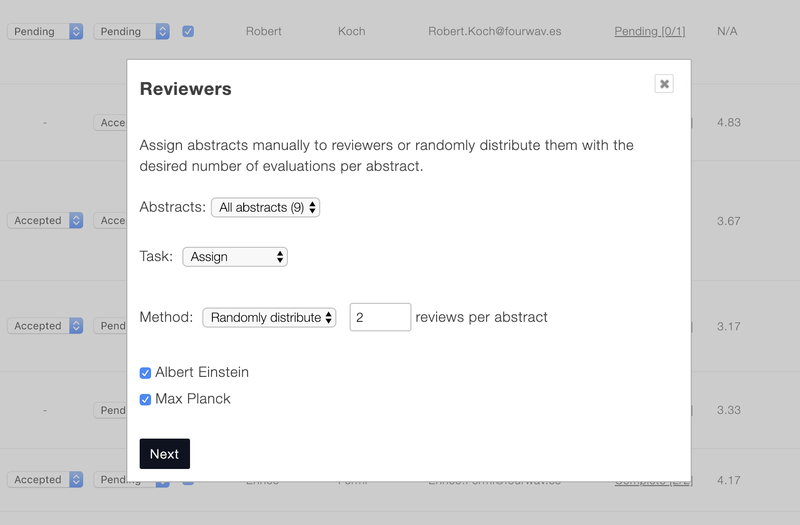 You can click Reviews in the sub-menu (Data -> Abstracts) to see the review assignments. An action column where you can delete or edit the assignment. The abstract title which you can click to edit the review. The review status, which can be one of: pending, complete, conflict of interests or missing required fields. The date and time the assignment was last modified. A column for each review criteria. You can filter the table to display the assignments of specific reviewers or that have a specific review status. You can also filter the score type criterias for a specific score. As an event organizer, you can delete or edit any review by clicking the trash icon or the pencil (or by clicking the abstract title). 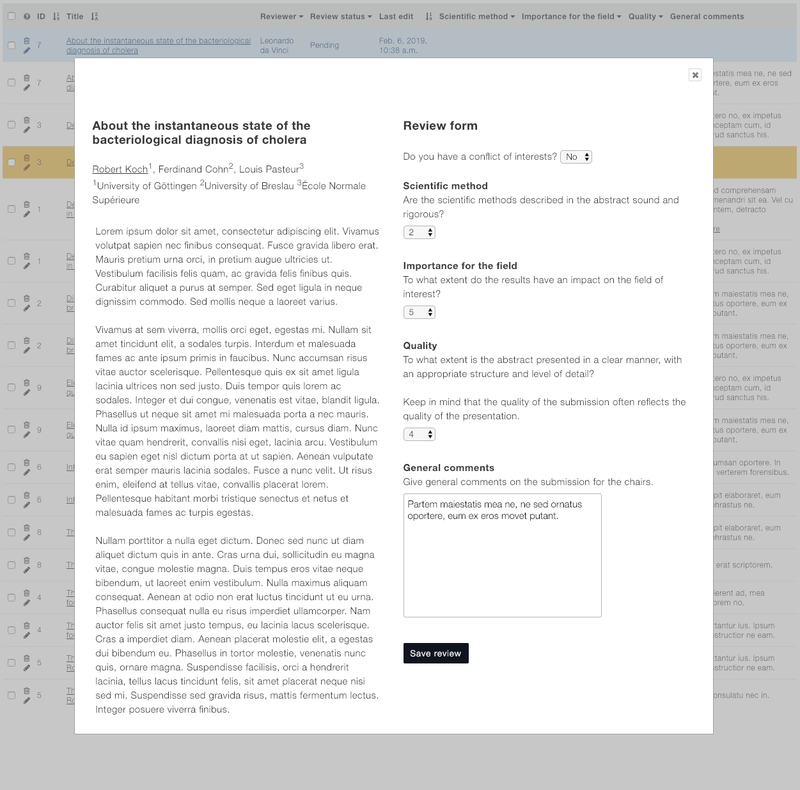 You can send an email to your reviewers directly from Fourwaves. Simply click the Send email button. You can filter your list to show specific reviews, for instance those that are not completed and send an email to the corresponding reviewers. Even if the table shows multiples assignments for the same reviewer, there will be only one email sent per reviewer. You can generate an Excel file containing all the review data. You can sort by abstract title or ID or filter your list before clicking Export to generate the Excel file. In the export menu, you can choose which subset of abstracts to export and which columns to include in the Excel file. From the abstract table, you will see two columns per abstract. The review status shows either NA (if it hasn't been assigned to any reviewers) or it shows the status of the review with two numbers indicating 1- how many reviews are completed on 2- the total number of reviewers assigned. For example, Pending [1/2] indicates that from a total of 2 assignments, only 1 has been completed. Complete [2/2] indicates that all 2 reviews are completed for this abstract. You can filter your abstracts with this column to find those with an incomplete review status. Review score: shows the mean of means for every review criteria of type Score for all completed reviews of this abstract. You can sort your abstract table by score to see the top scored abstracts. By clicking on the review status, a window will open showing all reviews for each assigned reviewers. This will allow you to have a clear overview of the reviews for this abstract and read text comments from the reviewers. If a conflict of interests was declared, it will be visible next to the reviewers name. As a reviewer, you received an invitation email with a special link. The link allows you to activate your Fourwaves account and set a new password (if not already activated for a prior event). Once activated, you'll be redirected to your assigned reviews. It is normal to see no reviews at first, as the organizers must assign abstracts to the reviewers after they invite them. The link works for 6 months, but if you need to access your assignments after this, simply login to your account, go My events and click the appropriate event. Once the organizers will have assigned abstracts to you for review, they will appear in the table as shown below. Blue: the review is pending. White: the review is complete. Orange: you declared a conflict of interests for this abstract. Yellow: your review form has missing required fields (only if new review criterias were added after you completed the review). Click on the abstract title to open the review menu. You will see the abstract on the left and the review form on the right. The first question asks if you have a conflict of interests. Then all the review criterias which you need to complete are displayed. Click Save review once your review is completed. You can edit your review as long as the review period allows. Once all reviews are complete your job is done! You do not need any additional steps to submit your reviews. An abstract with a conflict of interest will display a warning in the review summary, next to the corresponding reviewer. You can also identify the assignments with a conflict of interests from the reviews table by filtering the table by Review Status with Conflict of interests. Delete the review by clicking the trash icon. Go back to your table of abstracts. Select the corresponding abstract using the checkbox of the first column of the table. Click Reviewers, then choose the taks Assign, method Manually then select the new reviewer. Confirm that you wish to proceed with the new assignment. The new assignment will appear in the Reviews table with the status marked as Pending. Please note that you must contact the reviewers individually when you assign new abstracts to them.